Experience the High Energy Magic and Comedy of one of the East Coast's premiere entertainers... Speed. Speed is the original "High Energy Magician and Illusionist" known for his hyperactive, fast-paced, fun and modern performance style. This amazing magician has performed over 3,500 live shows across the entire East Coast and Canada. Speed has been featured in many Newspapers, TV, Internet and Radio Station Programs. 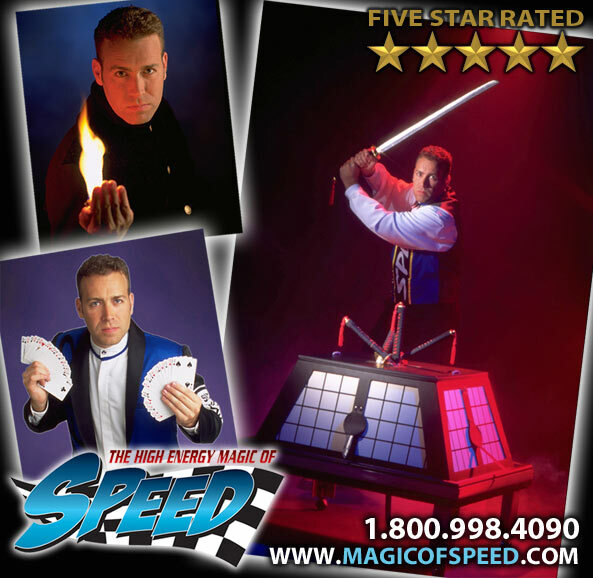 For more information regarding the High Energy Magic of Speed, you can visit us online at www.magicofspeed.com or call us at (800)998-4090. Albany New York Magician: Domino The Great, is NY's newest rising star for family entertainment and magic shows. Domino The Great is one of the very few children entertainers that perform full-time all over New York state. Domino was one of the few (if not only one) magicians from Albany, NY that was invited 3 TIMES to perform at the Annual Easter Egg Roll at The White House in Washington, D.C! Whether it's your Child's Birthday party, Daycare/Preschool, Holiday Shows, Elementary Schools, Summer Reading Library programs, Family Fun Days or Corporate Family Event; Domino has a remarkable rapport with children. The smiles are unbelievable; especially when all the children are talking about all the fun they had with New York's Favorite Kidshow Magician. Quite honestly, Domino knows what kids like, because he's still a kid at heart himself! 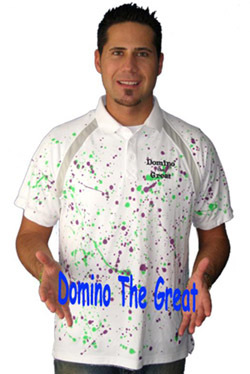 If you're planning an event anywhere in the Northeast, be sure to call Domino The Great first! Here are just a few of the cities that Amazing Magician: Domino The Great travels to all throughout New York State: Albany, Clifton Park, Saratoga Springs, Troy, Schenectady, Amsterdam, Glens Falls, Kingston, Poughkeepsie, Newburgh. This Comedy Magician is always performing his magic shows all throughout Westchester County as well: Mahopac, Brewster, Ossining, Bedford, Yorktown Heights, Mt. Kisco, White Plans, Yonkers, New Rochelle, Scarsdale, Mt. Vernon, Port Chester and yes even New York City. Call TODAY - 877-322-1566 or 401-474-7027 to book your next kids event and make it the best ever! New York Magician Evan Paquette, a.k.a. "Magic Evan," specializes in performing magic shows for kids and families. Evan dazzles and delights audiences across NYC (including Brooklyn, Queens, Manhattan, Staten Island, and the Bronx) with his comedy and amazing magic. Evan's unique because he has earned a graduate degree from NYU and uses his experience as both an educator and a performer to customize every show - which means you can sit-back, relax, and enjoy the magic with those who matter most... your family and friends. "Evan is wonderful!" - Julia Chang, Director of Children's Programming, New York Public Library Visit www.magicevan.com to check your date... before the rest of his availability disappears! See amazing magic acts including live doves appearing from nowhere, unbelievable card tricks, scarf tricks, comedy acts and much more. Many tricks call for volunteers to participate. Great for children's birthday parties, churches, schools, theaters, restaurants, malls etc. Optional items include balloon animals, and stage illusions such as sawing a girl in half, and a guillotine illusion in which a large blade is seen visibly passing through the volunteer's neck. In addition, Jeremy also does Gospel Illusions in which the Word of GOD is presented using magic tricks. This can be used as a ministry for churches and other places. The price includes a full show, the length of which can vary. For twelve years I have been your best source for delightful magic and fun family entertainment in the Albany, NY area. I am dedicated to providing you and your young guests a memorable experience. From magic to face painting, temporary tattoos, sand art, and party supplies, I have all you need to create a fun and festive event. All of my shows and services are family friendly and appeal to a broad audience. I have been doing magic for the last 40 years. I am a member of the I.B.M. and I also collect Tenyo Magic. Looking to make your Childs Birthday Party The Talk of the town?... Make Your Child The STAR of the show and Book Today. Featuring Comedy Children's Magician Bob Swislosky. Attention Fairs And Festivals.... We Have A show for you. Entertaining Central NY Call Today for a free Quote. Mention This web Site and recieve $50.00 Off you Booking or A free Upgrade. Born in Brooklyn NY and living most of his life in Yonkers, NY, Philip Klipper was bitten by the magic bug when he was just 10 years old. What had ignited his interest in magic? He replies with a great big smile. He'll never forget when his cousin Marty used to come over to play bridge with his parents. Before the game Marty would show him magic tricks. "He just blew me away!" Philip interjects. His fascination with the art of magic grew. On Saturdays Philip would take a bus and a train to get to Louis Tannen’s Magic Shop in the heart of New York City. This was, and is still, one place where amateurs and professionals alike get together to hone their magic skills. Philip, at the young age of seventeen, became one of the youngest professional magicians in the tri-state area. Eventually Philip was hired by the Westchester County Parks & Recreation Department to perform his magic show around the county in Parks and Camps every summer. Philip Klipper continues to mesmerize young and old alike. If your company is trying to fill a trade show booth or entertain guests at your hospitality suite, Philip Klipper is your best choice. Combining Philip’s marketing degree with his incredible sleight-of-hand will provide your company with the best solution for your trade show, sales meeting or hospitality suite. If you’re planning a private affair, Philip Klipper will provide not only an entertaining experience, but a memorable one as well. Philip Klipper is available to perform at Communions, Bar/Bat Mitzvahs, Weddings, Graduations, Birthdays, or any private event you have in mind. Call now to receive more information and discuss what Philip can do for your event to make it more exciting, incredible and magical. Steve Johnson has been entertaining the public with his Magic Variety Show for over twenty years. The show has enjoyed successful reviews at many events throughout the north-eastern United States. If you are looking for a program that will create an impact at your next event, act now to reserve your date early. Arthur Martello has been a member of the Society of American Magicians and the International Brotherhood of Magicians (Order of Merlin) for the past 35 years. Although his interest in magic began when he was around 8 years old, it was not until the mid 70’s that he decided to become more dedicated to the art. By that time, he was already employed as a Speech Pathologist, Teacher, and Administrator working at a school for the deaf and adjunct senior lecturer at 3 different colleges where he taught classes in Anatomy and Physiology, Phonetics, Auditory Training, Acoustics and Lip-reading. When he retired from those positions, he moved full time to his Catskill Mountain log cabin that he built in 1972. In the year 2000 he accepted a part time position as Chairperson of the Committee on Special Education for the Margaretville Central School District. Although this position takes up a good deal of his physical and mental time, he maintains an active interest in magic and has performed locally for various grous and organizations. Matt Stevens Magic & More offers a wide variety of entertainment packages that for any type of special occasion. 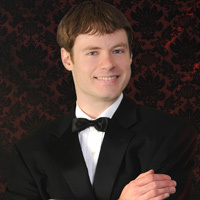 Matt Stevens offers several magic shows and strolling entertainment. Chris Connelly is an award-winning comedy magician based in Westchester, NY, who travels internationally for shows and events. He is known for performing a blend of magic and family-friendly comedy at events ranging from birthday parties to formal stage shows. Chris's most popular routines feature intimate magic as well as large-scale illusions. Contact us today to reserve a date! Michael @ Magic Legacy combines comedy magic and mentalism with a little street magic mixed in. Have a variety of shows. I also offer a dinner and magic with a full caberet show. call for prices & availability 914.489.4718.